A month following Robert E. Lee's surrender at Appomattox Courthouse, the Union armies paraded through the streets of Washington, D.C. The event, called the Grand Review, was spectacular. First, General Gordon Meade led the Army of the Potomac for six straight hours, their bayonets so freshly polished they gleamed in the sun. On the following day, General Sherman's Army of the West entered the city. Their uniforms, according to a New England soldier, had weathered to a "cross between Regulation blue and Southern gray. Their hair and beards were uncut and uncombed; huge slouched hats, black and gray, adorned their heads; their boots were covered with the mud they had brought up from Georgia." In the four years of war (1861-1865), overt six million men joined the fight, and more than half-million never made it home. Historian Shelby Foote wrote, that for every two men who marched up Pennsylvania Avenue in the Grand Review, the ghost of a third marched with them. In a letter home, spectator Ellen Hooper said "It was a sad day too--you felt as if there were another army--larger and finer--marching above them." If you have an ancestor who was of fighting age between 1861 and 1865, it's likely you'll find them in military records. And fighting age could be anything from 14 to 60; boys lied about their age to enlist, old men so they could join the fight. Was your family member one of them? The best Internet site for discovering whether your ancestor was among those who served, either North or South, is the Civil War Soldiers and Sailors System (CWSS). The 6.3 million soldier records in the National Archives were digitized and made available in a freely searchable database. Additionally, the site includes: histories of regiments in both the Union and Confederate Armies, links to descriptions of 384 significant battles of the war, and a database of prisoners at Andersonville (Confederate prison) and Fort McHenry (Union prison). A work in progress, the CWSS will eventually add more information about the war, including more sailors and prisoner-of-war records. To search CWSS, enter at least a last name. 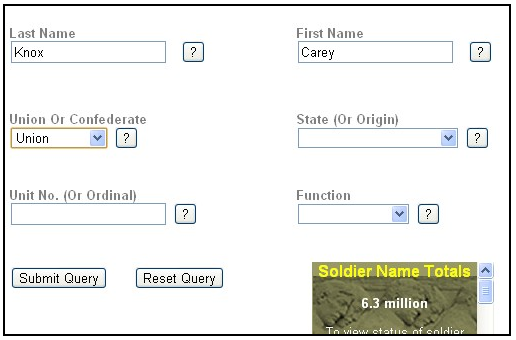 Optionally, you can add a first name, Union or Confederate, unit number, state, and function (i.e. artillery, infantry). Submit the query for search results. 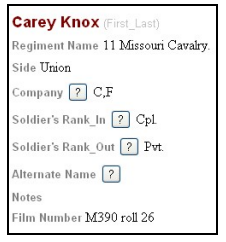 In this case, there was only one Carey Knox listed in the Union Army. Click the soldier's name for information on his rank at both enlistment and discharge, his regiment, company, and any alternative names he might have used. As you can see from this screenshot, Knox went in as a Corporal and came out as a Private. Wonder what happened? If you click the name of the regiment, you'll see its history, from date of organization to date of disbandonment. The regimental history is important because it will tell you all of the places the regiment went during the war as well as the battles in which they fought. Just as valuable for genealogy researchers is the ability to search for other people in the regiment as well as browse through the list of names. Don't be surprised if you find siblings in the same regiment as well as fellow soldiers who later married your soldier's sister. If you're interested in finding even more about your ancestor's regiment, you can search the Internet. 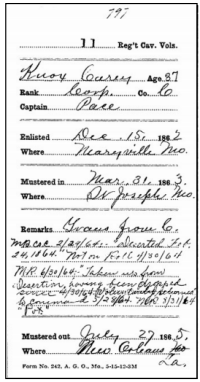 For example, a Google search for Carey Knox' 11th Missouri Cavalry turned up an article at the FamilySearch.org wiki as well as records in the Missouri State Archives online. The Archives even posted digital images of records. From this, it becomes clearer why Knox was demoted - at some point in his Army life he was a deserter. "history of the 11th Missouri Cavalry" or "regimental history 11th Missouri Cavalry"
Once you find a website with a regiment's history, it's possible your ancestor will be mentioned by name. Another site that's particularly useful for finding Civil War-era photographs is the American Memory Collections at the Library of Congress. Among the collections are Civil War images from the New York Historical Society, Civil War images from the Matthew Brady studio, and History of the American West from the Denver Public Library. Each of these collections is searchable by keyword, a name or subject index. Even though you may not find your ancestor, you will be able to find photos of soldiers from his state or photos of his battles or even photos of people who served in the same branch such as cavalry or infantry. Because such as a large portion of the population took part in the Civil War, your chances of finding a Civil War soldier are excellent. Not only can you follow his route across the eastern or western battlefields, you can take pride in the knowledge that he took part in one of the most important moments in American History.